Great Eastern Buildings Peabody Housing Estate. 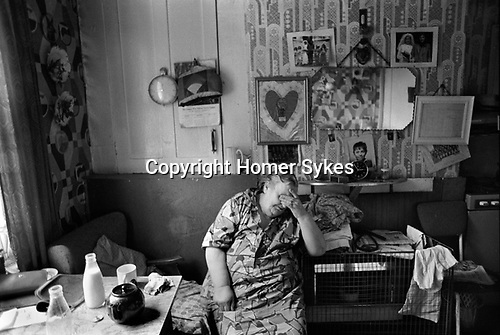 A resident in her living room covers her eyes, head in hand, exhausted after a hard days work. She is wearing a typical 1970’s housecoat, an overall that covered her best clothes and was often worn rather than an apron for housework. Yesterdays empty glass pint milk bottle and todays fresh pinta stand on the crowded table while the tea brews. On the walls of her room are photographs of her daughters wedding and a large lace heart shaped decoration, reminding her that she is always loved. These were commonly sent back to mothers and grandmothers by soldiers stationed in Germany at the time. These crumbling blocks of flats were beginning to be torn down during the mid 1970’s.